Remember all those months back when Paula Deen came out as having diabetes conveniently around the same time she teamed up with pharmaceutical company Novo Nordisk, causing notorious culinary scrapper Anthony Bourdain to tweet, "Thinking of getting into the leg-breaking business, so I can profitably sell crutches later"? Deen then responded by calling his comments cruel (ha, ya burnt, Tony! ), but that hasn't stopped Bourdain from talking about how Our Lady of Butter and Oil is slowly destroying our culture one frosted strip of bacon at a time. Or at least it hasn't stopped him from continually being asked about it, as demonstrated here by GMA's Josh Elliott. 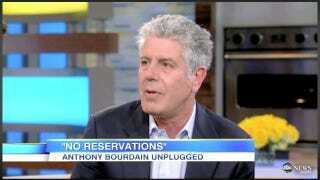 Bourdain's newest season of No Reservations premieres tonight on the Travel Channel. Time your insulin shots accordingly.